Water Conservation | Topcon Positioning Systems, Inc. Proven field design and land forming create a win-win for farmers and the environment. 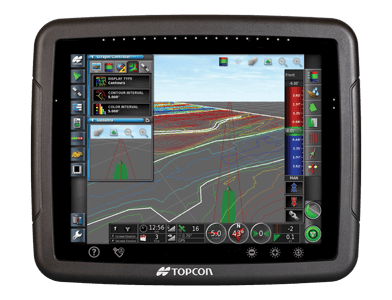 Topcon provides the most efficient solutions to improve farm field slopes and drainage. Topcon delivers superb accuracy in either single or dual scraper configurations. Our dual-constellation satellite reception comes standard with all our systems, and more satellites equates with both higher accuracy as well as more continuous coverage. And with our laser-based leveling, Topcon offers the highest grade repeatability of any laser, at 7 arc-seconds. The Topcon GNSS landforming solution allows the operator to survey, create cut/fill maps, and start grading all without ever leaving the cab. Our Piecewise Continuous Slope functions produce superior results while conforming as closely as possible to the original terrain. 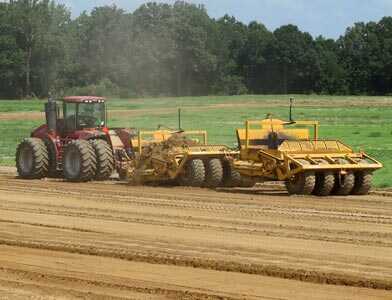 This improves results, reduces soil disturbance, lowers cost, shortens the project timeline, and saves you money. Only with Topcon. The best results provide the best returns. Topcon delivers superior results faster and at lower cost. And great landforming or leveling set you up for improved productivity over the long haul, but with the lowered operating cost associated with minimizing water usage. Topcon solutions have delivered these benefits for many farmers across the world, and we look forward to helping you achieve even greater results.